It’s amazing what you find if you take time to look about; let me give you an example. For months now, I have been fishing from a certain spot just down the road from the house. I always travel the same path, stopping every now and again to admire the Bay or the flora and fauna as it changes from one season to the next. When I arrive at ‘my spot’, a huge flat rock that slopes gently towards the deep waters of Dunmanus Bay, I get on with the task at hand (chucking a lure out to the waiting fish) and never really pay much attention to the environment around me. This all changed a few days ago. I arrived at the spot to find that the tide was out. Very far out. 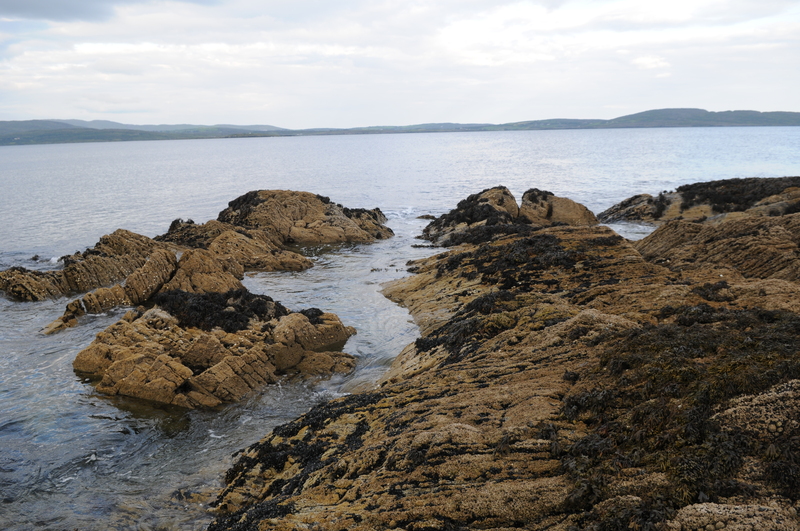 Where once there were metres of water between where I stood and the dark rocks far below, I could now easily climb down, browse the rock pools and, most importantly, retrieve the lures that I lost over those previous attempts at catching any fish at all from Dunmanus Bay. As I explored the pools in an attempt to get closer to the waterline so that I could start fishing (and yes, I have since learned that when the tide is out it’s the worst time to go fishing), I suddenly discovered, in the crystal-clear water of one of the pools, these purple spiny globes. 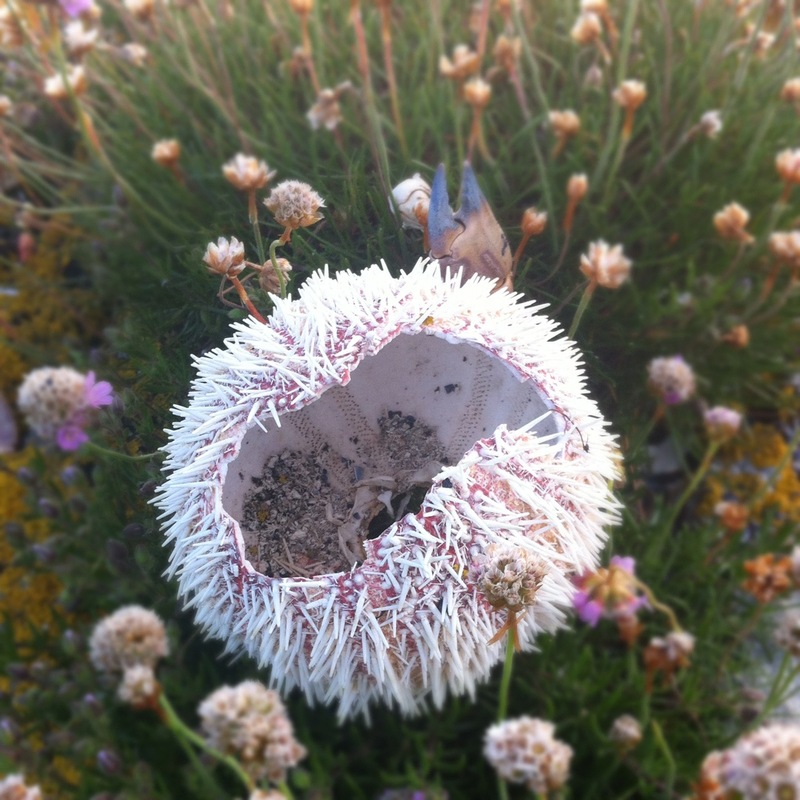 I had stumbled across a nest of sea urchins. 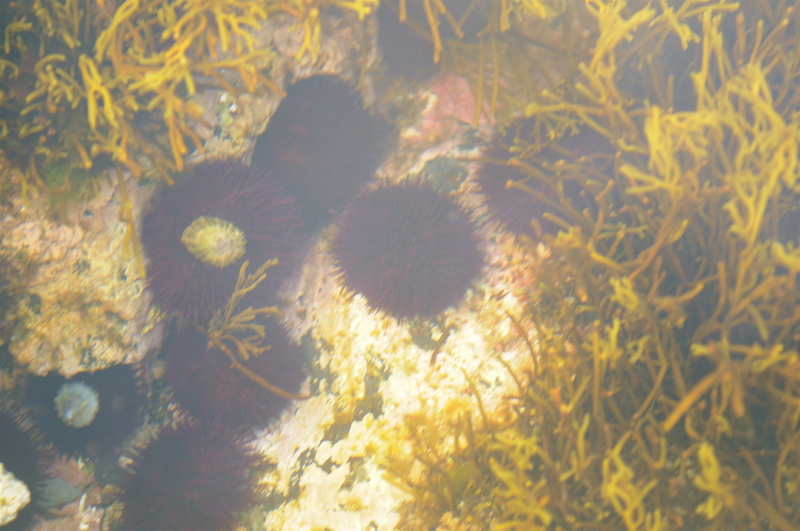 Believe me, this was not just one or two sea urchins; I counted fifty and then gave up. The pool, which would normally be completely out of sight and out of reach, was full of these prickly creatures and I couldn’t resist reaching out and picking one up. Sea urchins, spiny but delicious? Now I know that for many out there sea urchin is a delicacy and we had eaten these at the Ivory Tower in Cork city but I have to admit that I am completely stumped as to how to prepare or deal with these amazing creatures in the kitchen. 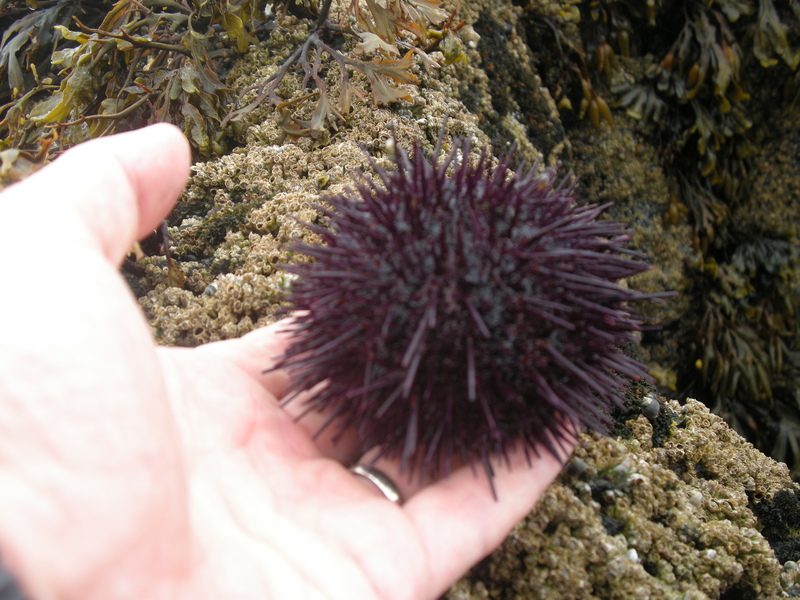 After a quick search on the interweb and some really good advice from a true food hero (thank you once again Sally McKenna), I discovered that while the sea urchin is not that difficult to prepare the best time to harvest is in September. Right now they have other things on their tiny little minds, hence the army of them in the pool. Apparently, it’s the season of love for sea urchins and a few prickly spines aren’t going to get in the way. 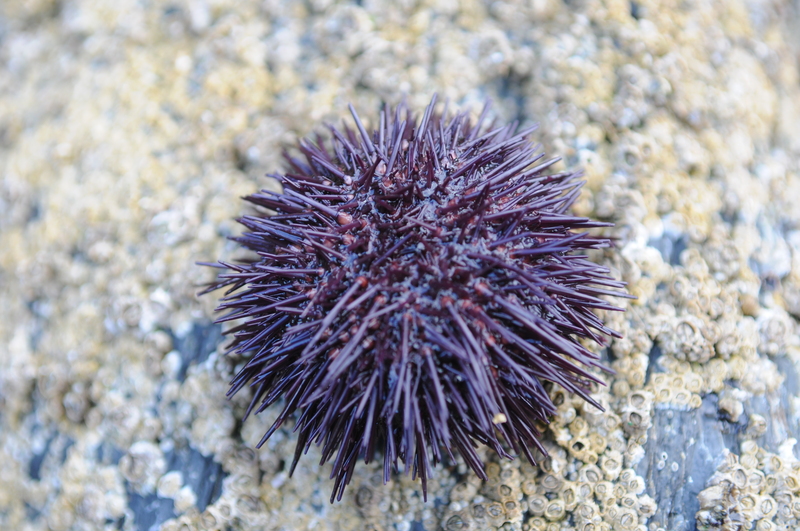 A sea urchin ready for some creative cookery but what’s the next step? So, from now until September I will be closely guarding the secret location of my sea urchin cache. 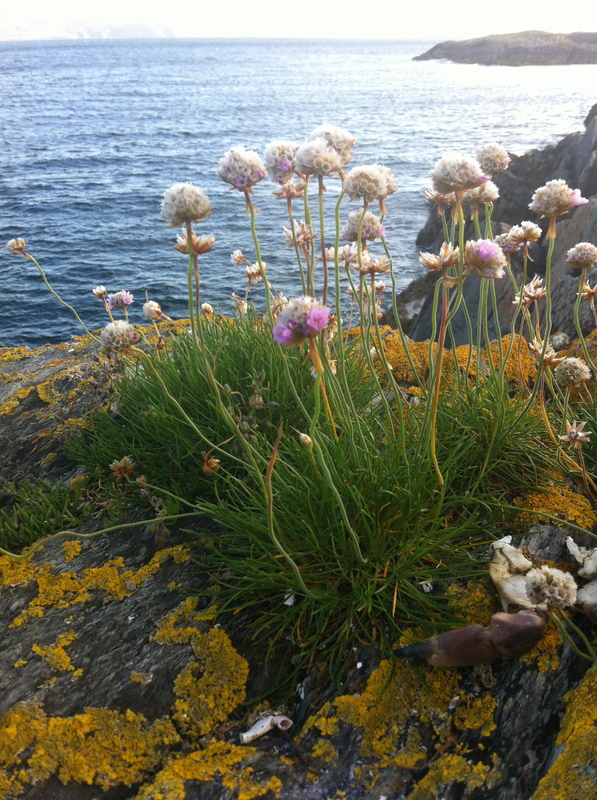 However, I could do with some recipes and suggestions as to how we should enjoy these delicacies from Dunmanus Bay and would love to hear from anyone who can help. As I climbed back up the rocks to my spot, I suddenly got the feeling that I was not alone, I looked over my right shoulder to find four pairs of eyes watching me. There, floating not 10 metres from me, four seals bobbed gracefully in the water as they munched on the fish I had come to catch. I found a comfortable rock and sat basking as the seals continued eating their lunch. 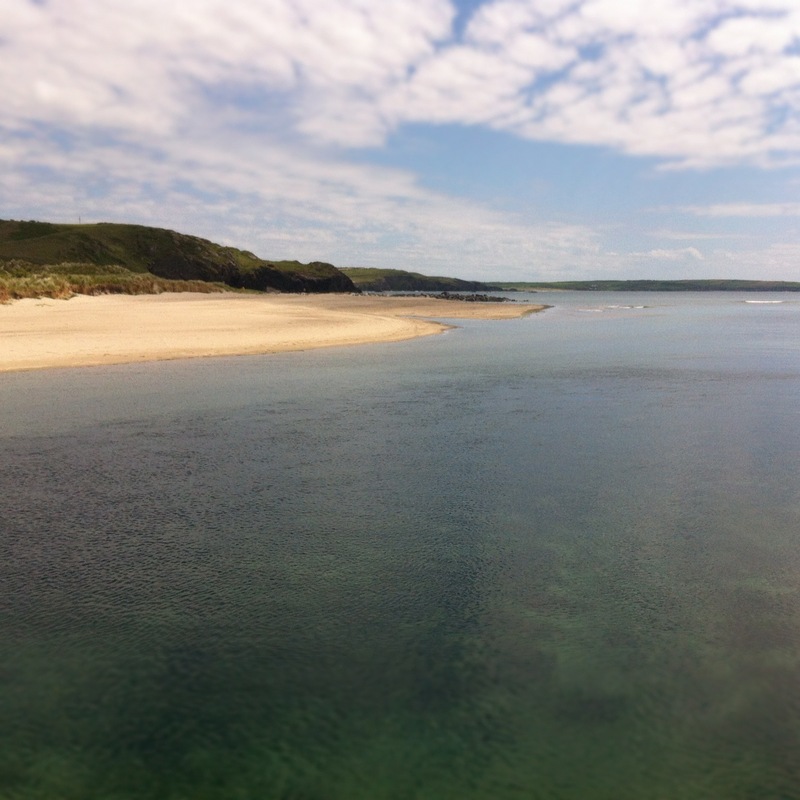 I was amazed to see the hidden landscape that was now revealed by the receding tide. Rocks with colonies of baby mussels clinging firming to the surface, sea snails, anemones, starfish and, of course, the ever present collection of seaweeds, all laid bare before me. As I sat there, taking all this in, something climbed out of the water and sat on a rock just a couple of metres away. This new arrival was not a seal; the seals had moved on (having, I supposed, wolfed down the underwater buffet). It sat there looking directly at me and then got back into the water and disappeared. An otter! Empty and sun bleached. Somebody knows how to get the best out of these prickly creatures. Suddenly there was a splash and there, swimming on its back, the long brown otter was on the surface and this time it wasn’t alone. As it climbed back on to its rock I saw, held firmly in its jaws, a fish, a cuckoo wrasse I think, and the otter set about enjoying its lunch. With all these expert anglers around, I decided to call it a day and headed home, fishless once again, but amazed at the diversity of wildlife both above and below the waters of Dunmanus Bay. The Caribbean? No, West Cork baby!!!! A new departure but an old subject. A new Blog you might be interested in following … perhaps?